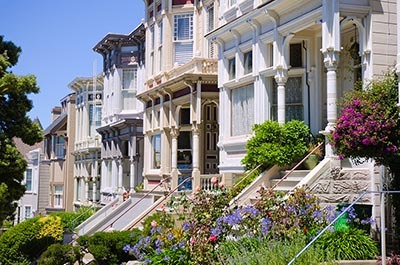 San Francisco was California’s least-affordable housing market in the fourth quarter of 2016, with just 13 percent of the county’s population able to swing a mortgage on the median-priced home. And while San Francisco was one of the few U.S. counties to see housing affordability increase in the first quarter, home prices throughout the Bay Area exceed what the average wage will allow. That’s according to ATTOM Data Solutions’ Q1 2017 U.S. Home Affordability Index, which says that the average U.S. household would need to spend 33.6 percent of wages to afford the median-priced home, bringing affordability to an eight-year low. In a statement accompanying the report, company Senior Vice President Daren Blomquist said that while rising mortgage rates are causing affordability to erode, the fact that wage growth is outstripping home price growth in more than 50 percent of markets could help slow that trend. Prices in about one-quarter of U.S. housing markets are higher than the maximum 43 percent debt-to-income ratio for a qualified mortgage, according to Consumer Financial Protection Bureau outlines. All nine Bay Area counties are among those markets, including Marin County, one of five counties in America where buying the median-priced home requires more than 100 percent of average wages. Santa Cruz is also among the nation’s five least-affordable counties for homebuyers. On the plus side, San Francisco was one of 9 percent of housing markets to see affordability improve on an annual basis, thanks to wage growth of 10.5 percent. That said, purchasing the median-priced $1,052,500 home in San Francisco requires 84.3 percent of the average household income. The aforementioned housing-affordability issues that Bay Area residents face, along with ever-worsening gridlock, is prompting more locals to think about moving elsewhere. Millennials in particular have plans to flee, even after another recent analysis said that young workers are still flocking to the region for high-paying jobs. Citing poll results from Bay Area Council, The Mercury News reports that 40 percent of Bay Area residents are thinking about leaving in the next few years, up from 33 percent in last year’s survey. More than half of respondents cited the region’s generally high cost of living as the biggest problem, while 41 percent pointed to traffic. Millennials, who are key to the Bay Area economy’s health, are even more frustrated with life here, with 46 percent making plans to leave over the next few years. A lack of homes for sale isn’t just a problem in the Bay Area — it’s a national dilemma, with the fewest number of properties on the market in nearly two decades. CNBC reports that home-supply conditions have reached their lowest level since the National Association of Realtors began tracking that data 18 years ago. New home construction is running at about 75 percent of its normal levels, and builders are bringing few starter homes to market, as high land, labor, and materials costs minimize their profit margins. Investors purchased about 4 million distressed properties during the housing crash, and the fact that they’re not returning them to the market is exacerbating the nation’s inventory woes. Price appreciation may also be a contributing factor, as more buyers decide to stay put and pump their home equity into renovations. Mortgage rates dipped for the second straight week, though higher rates and fluctuations don’t appear to be stifling home sales yet. According to Freddie Mac, 30-year, fixed-rate mortgages averaged 4.14 percent for the week ended March 30, down from 4.23 percent the previous week. Fifteen-year, fixed-rate mortgages averaged 3.39 percent, decreasing from 3.44 percent on a weekly basis. In a statement accompanying the report, Freddie Mac Chief Economist Sean Becketti said that new home sales grew by 6.1 percent in February to an annualized 592,000, much higher than expected. But as interest rates gradually rise later this year, Becketti expects them to put a cap on home sales activity, as he explained in Freddie Mac’s March Outlook.